I was really saddened when I knew Girls Talk will only be until this June, I understand how Niko ganda is feeling and although I love it to continue, there’s nothing more I can do than understand her reasons. I was absent from GT the whole month since I have not brought pictures of my past friends here in my present house, all of my single blessedness memorabilia were left at my moms house. But not all endings are sad, Niko is giving away $20 in a form of a raffle for those who can complete this month’s GT. I’m certain I will qualify for the raffle… nyahahaah! Anyway this week’s topic is all about my shower loot. I’m no vanidosa when it comes to bathing, I can survive with Safeguard and shampoo, I don’t even put hair conditioner often because I have limp hair and it easily fall off. I love Johnson’s baby wash, I use Ponds anti-bac facial foam for my face and obviously I use Sunsilk for my hair and once a week I apply hot oil treatment, I don’t maintain a brand for this whatever suits my sense of smell I pick it up. The Suave smoother is daughter’s shampoo. And on top of everything, I use tawas, I don’t use deodorant… I’m afraid of parabens; I’m not ready yet to die early, nyahahahah! Aside from being effective, it’s very, very cheap…. So there, the rest are very basic, feminine wash, mouth wash ….etc…. A peep at where I scrub and scratch my kili-kili, singit and all everyday. Thanks Sherry for the info, put some amends already .... feeling too tired to redo... nyahahaha! 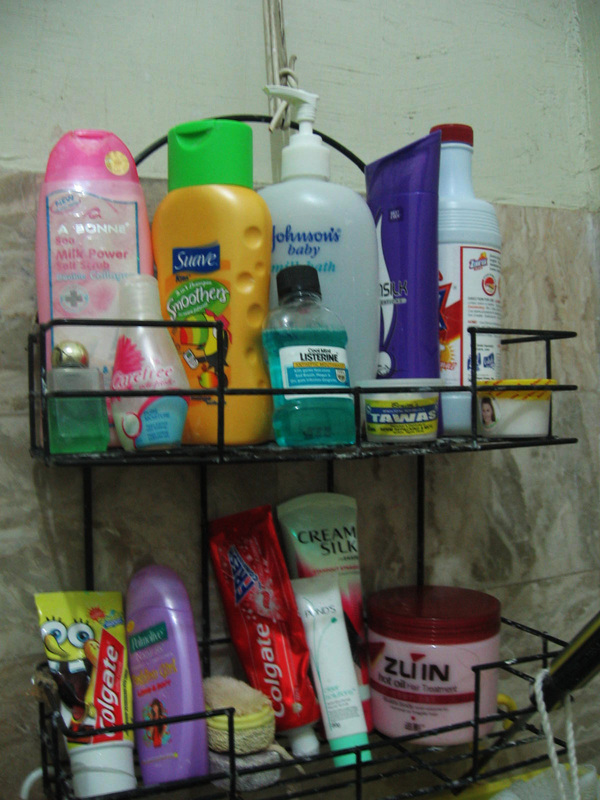 ako naman, i can't stand without conditioner.. hehe..
Johnson's baby wash is not just for babies :) I use it too sometimes. I think we are one of the few families who don't brush the teeth in the bathroom (we brush our teeth in the kitchen), It just feels a little awkward brushing the teeth near the toilet. Hehehehe. aww..tawas!yan din ang gamit ko before but now I still use rexona of pinas na dinala ko pa hanggang dito lol! wow ang galing mo ate..adyan na lahat..
nweis nice kasabihan "A family that stays together, brushes together" ahahhah nice one! change links tayu =) ty! ang galing mo naman at very organized ang inyong bathrom! 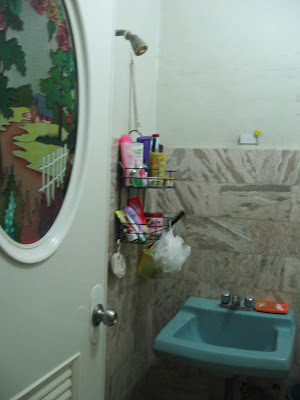 yung akin hindi..
we are both sunsilk girl vernz...hehe..i agree with the ladies here..nice bathroom and very organize..I love that toothbrush holder..
thanks for joining GT ha!!! See u next week, cant wait to see what’s inside your vanity kit! happy weekend girl!